I love mixing patterns and textures, especially on my table! 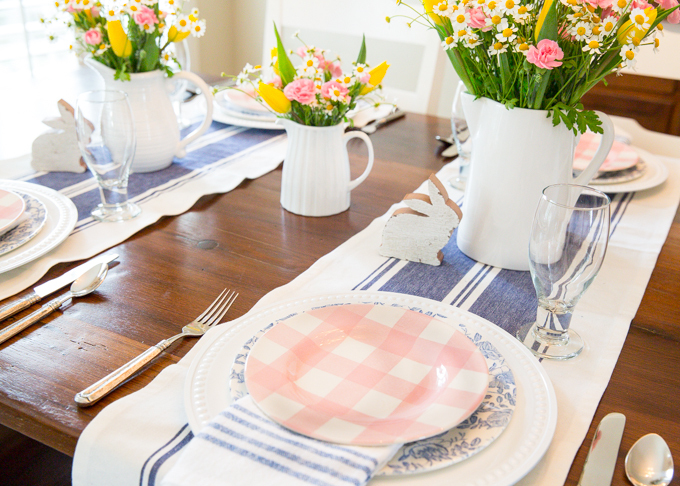 I fell in love with these pink plaid plates and immediately knew that I wanted to set them with blue floral. I love the softness of these shades of pink and blue together! 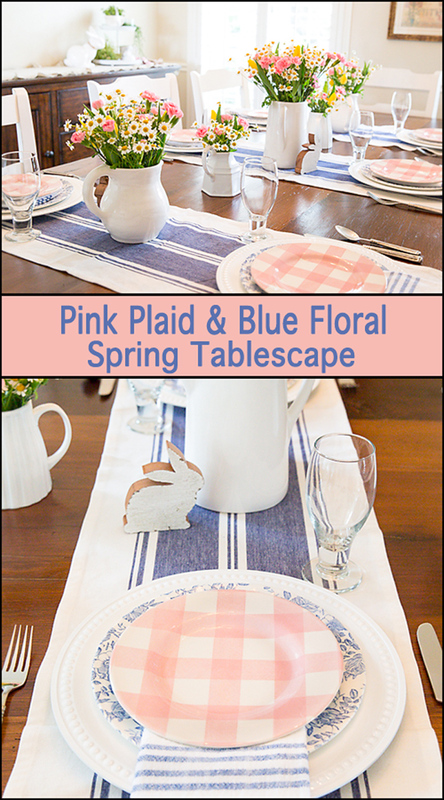 I think the Pink Plaid & Blue Floral Tablescape would be beautiful as an Easter table, or anytime Spring or Summer! I wasn’t sure what type of centerpiece I wanted to use, so I decided to keep it very simple with some fresh flowers. Trader Joes rarely disappoints in the fresh floral department! 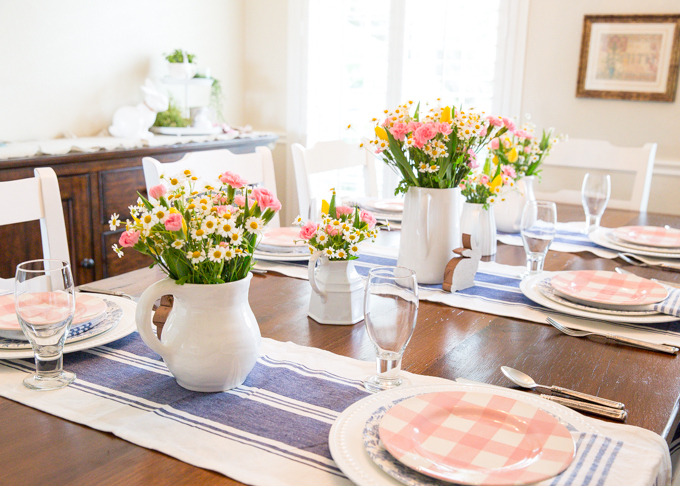 For a casual table, I typically use these plain white pitchers or mason jars for vases and keep the arrangement simple and casual. 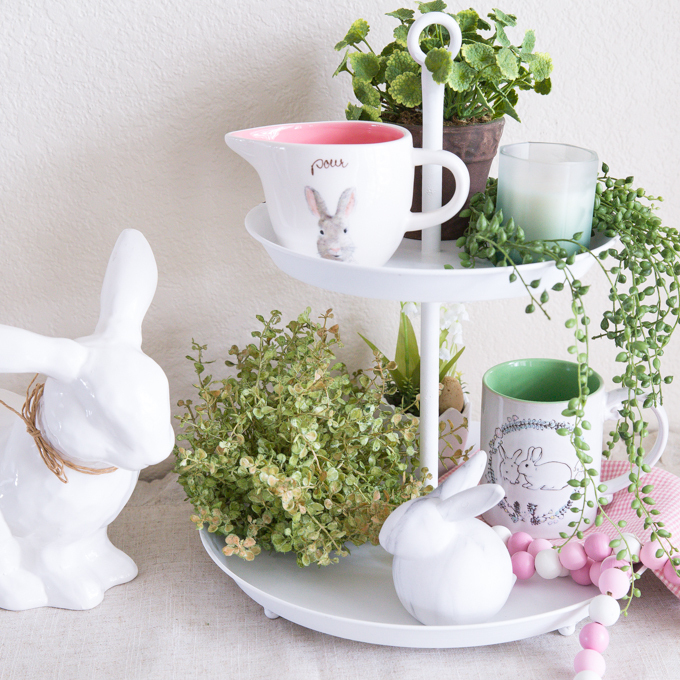 I added a few chippy white bunnies for Easter! In case you’re wondering about sources. 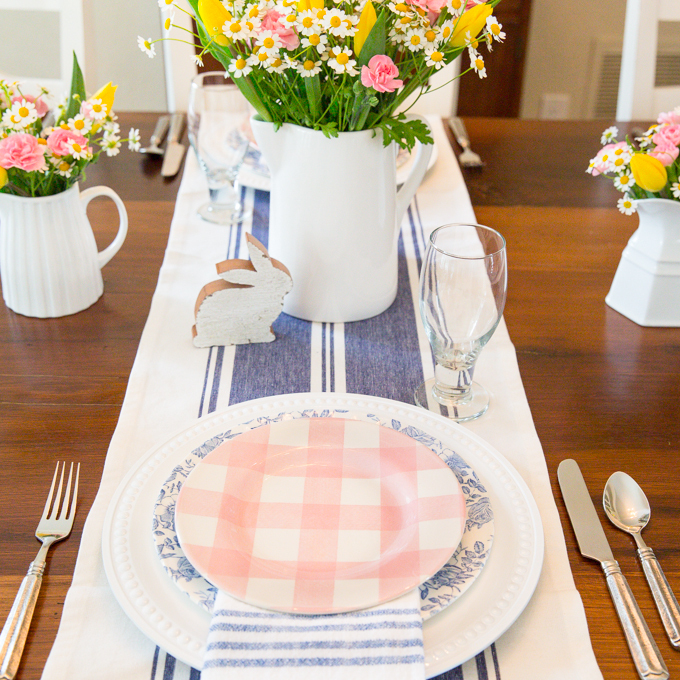 The striped runners and white charger plates are from Pier1. 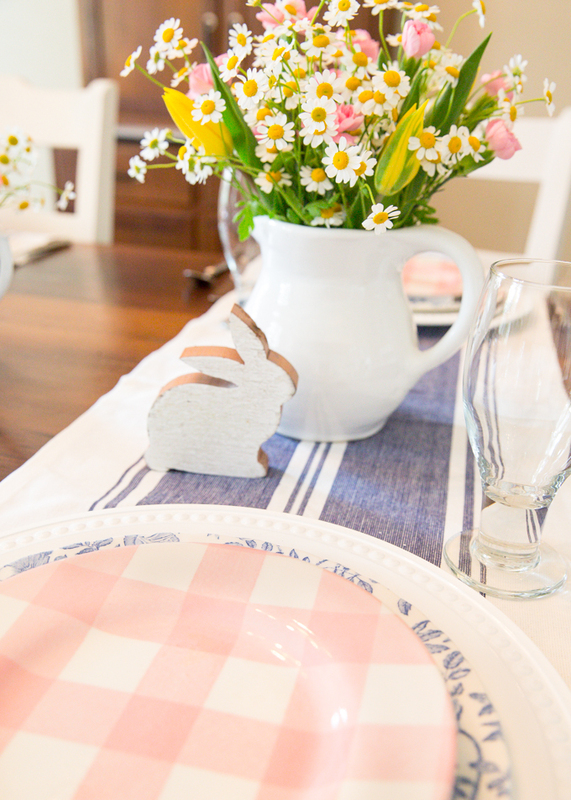 Both the blue floral and pink plaid plates I picked up at Marshalls. Assorted white pitchers are Home Goods finds. The napkins are from Amazon. 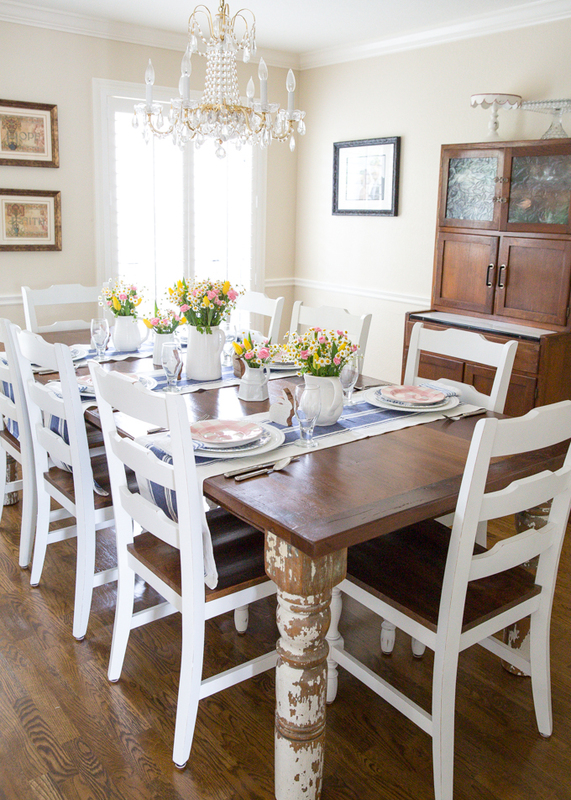 I love doing a pull back shot of my dining room! I had my dining table custom made and the chairs are from Pier1. The antique hutch belonged to my mom and is a piece I’ll cherish forever. Please don’t forget to Pin an image or two to your favorite Pinterest Boards!